J Clin Aesthet Dermatol. 2011 Jul; 4(7): 25–34. Despite these findings, some clinicians have been reluctant to accept laser lipolysis citing longer procedural times, increased risk of adverse reactions, and lack of evidence supporting superiority over traditional liposuction. On the other hand, surgeons already familiar with laser technology may more enthusiastically embrace laser lipolysis as an adjunctive tool to satisfy the growing demand for minimally invasive technologies that enhance body sculpting and skin tightening without disfiguring scars. Sasaki et al7 document that many experimental and histological publications have reported that external application of laser energies, including 1064nm and 1320nm wavelengths, and radiofrequency devices increase fibroblast numbers, stimulate new collagen, and augment tissue tightening and elasticity. Low level laser therapy and cryolipolysis are additional newer modalities purporting lipolysis and collagenesis externally. Until further optimization of these devices occurs, and penetration and absorption through the skin is efficiently achieved, internal application of laser energy may be the most effective method of reducing fatty tissue and enhancing skin tightening. The objectives of this article are to 1) discuss the progression of laser lipolysis as it pertains to the controversial skin-tightening debate, 2) discuss the latest understanding regarding the mechanism of action, 3) review the advantages and disadvantages of laser lipolysis, 4) discuss how to optimize outcomes and avoid pitfalls such as thermal injury, 5) highlight emerging uses for laser lipolysis, and 6) conclude with alternative modalities and how they may stack up against laser lipolysis. In 1992, Apfelberg8 was the first to describe the direct action of laser in the adipose tissue—laser lipolysis. In 1994, Apfelberg et al9 conducted the first multicenter trial studying laser-assisted liposuction. A neodymium-doped yttrium aluminium garnet (Nd:YAG) laser with 40W, 0.2-second pulse duration, 600μm fiber inserted in a 4 or 6mm cannula was used. This fiber was encased within a cannula and was not in direct contact with the fatty tissue. The study implied decreased ecchymoses, pain, and edema and less effort for the surgeon.9However, the benefit of laser lipolysis was not significantly demonstrated, it was not FDA approved, and the sponsoring company (Heraeus Lasersonics) abandoned the technology. After the FDA approved the first laser lipolysis device, a 6W Nd:YAG laser (manufactured by Deka and distributed by Cynosure, Westford, Massachusetts), a rapid influx of additional devices and wavelengths entered the market (Table 1). Aggressive marketing by these companies and word-of-mouth publicity from satisfied patients have peaked interest in laser lipolysis procedures. These systems employed a variety of wavelengths in an effort to pinpoint the most effective for lipolysis and skin tightening. In 2007, Mordon et al17 detailed a mathematical model of laser lipolysis that evaluated a 980nm diode device with a 1064nm Nd:YAG device. This study suggested that heat, rather than a particular wavelength, led to lipolysis and skin tightening. They cite an internal temperature range of 48 to 50°C as sufficient to induce skin tightening. In 2008, McBean and Katz18 studied a sequentially firing 1064nm/1320nm (SmartLipo MPX, manufactured by Deka, distributed by Cynosure) system for lipolysis of unwanted fatty tissue and skin tightening. Their objectives were as follows: 1) study the safety and efficacy of the device, 2) evaluate the skin-tightening effect by photographic documentation and measurements, 3) assess new collagen formation by histological and scanning electron microscopic studies. Twenty subjects were enrolled. Five of the subjects had 4×4cm temporary India ink tattoos placed at treatment sites and were measured at baseline and one-month and three-month intervals. Results showed reduction in localized adiposities with no adverse events. Of the subset of five patients, India ink tattoo maps demonstrated an 18-percent decrease in surface area indicating a significant skin-tightening effect. Histology by hematoxylin and eosin (H&E), methylene blue stains, and electron microscopy indicated new collagen and myofibroblast formation compared to baseline. This was the first study to demonstrate via objective measurements the skin-tightening effect of laser lipolysis with corroborative scanning electron micrographic images. As clinical experience, histological studies, mathematical models, MRI quantifications, and tattoo measurements accumulated, it became increasingly clear that laser lipolysis produces an objective effect both at a micro and macroscopic level. However, many clinicians requested more rigorous studies, particularly those in which an internal control could be performed. In 2009, Dudelzak et al19 treated the arms of 20 female subjects with laser lipolysis. Ten of the patients were treated with laser lipolysis alone, and the other 10 patients were treated with laser lipolysis and suction aspiration. The authors observed identical results whether or not post-laser suction aspiration was undertaken. Most recently, Dibernardo20 conducted the study many required in order to be further convinced that laser lipolysis added significant benefit to body sculpting. In 2009, Dibernardo treated 10 female patients with a sequentially firing 1064nm Nd:YAG and 1320nm laser on one side of the abdomen and liposuction alone on the other side. He then evaluated skin shrinkage through photographic imaging and measurement of temporary ink markings. Skin tightening was evaluated with an elasticity device. Measurements were taken at baseline and at one and three months post-treatment. The results demonstrated a significantly higher mean shrinkage ratio on the laser-treated side than on the suction side both at the one- and three-month evaluations. On the side without laser treatment, the mean skin stiffness and skin tightening showed no statistically significant difference from baseline. Three months after treatment, the skin stiffness and skin tightening were significantly higher on the laser-treated side. They concluded that laser-assisted liposuction has a statistically significant effect on skin shrinkage and tightening of the skin in the abdominal area when compared to liposuction alone. At this juncture, it is clear that laser lipolysis both liquefies adipose tissue and more significantly produces and remodels collagen fibers. Now, the goal is to standardize methods that will assist in optimizing results, safety, and efficacy. Goldman proposed that two properties must be considered in determining the efficacy of laser lipolysis given a particular device— wavelength and energy delivered.21 Different wavelengths have been selected for laser lipolysis in an attempt to specifically target fat, collagen (water), and blood vessels. According to the theory of selective photothermolysis, these chromophores will preferentially absorb laser energy on the basis of their absorption coefficients at specific wavelengths. Various wavelengths, including 924, 968, 980, 1064, 1319, 1320, 1344, and 1440nm, have been evaluated for interactions within the subcutaneous compartment (Table 1). Some authors have suggested that certain wavelengths lead to superior lipolysis. Parlette and Kaminer22documented that the 924nm wavelength has the highest selectivity for fat melting, but may not be as effective for skin tightening as other modalities unless combined with another wavelength.22 They continue by stating that the 1064nm wavelength has good tissue penetration, but relatively low fat absorption. The lower fat absorption of the 1064nm wavelength may be tempered by its superior heat distribution and therefore skin-tightening effect. Finally, the 1320nm wavelength demonstrates greater fat absorption with less tissue penetration and scatter and, therefore, may be safer for treatment around more fragile areas, such as the neck, inner thighs, and arms. These claims are not well supported in the literature; however, they have been identified as a few of the current theories. Photoacoustic, photomechanical, and photothermal effects are additional theorized mechanisms of action in laser lipolysis. However, in this author's experience with several clinical trials and histological examinations, heat is the primary stimulant for lipolytic and skin-tightening effects. During a 2008 pilot study regarding safety and efficacy of a combined 1064nm/1320nm device, McBean and Katz18 assessed temperature changes within a defined treatment area. Internal temperatures varied by several degrees Celsius when compared to external temperature as measured by infrared thermometer. According to Mordon's mathematical analysis and additional thermoregulatory studies,19,21 an internal temperature between 48 and 50°C must be reached for collagen denaturation and subsequent skin tightening. External temperatures between 38 and 41°C were identified as safe and efficacious. Histological slides from skin biopsies demonstrated new collagen fibrils, myofibroblasts, and lipolyzed fat cells. This author agrees with Goldman when he reports that most of the hypothesized actions (photoacoustic, photomechanical, or photothermal effects) are either secondary to, or have been replaced by, the idea that heat generated on tissue is the primary mode of action in laser lipolysis.23 Khoury et al24 proposed that photoacoustic ablation lends to thermal damage, although photoacoustic damage is difficult to evaluate histologically. Thus, the favored mechanism of action for laser lipolysis is a purely thermal effect (Figure 1). Given the progress of the last five years, several distinct advantages of laser lipolysis have become clear. One commonly promoted advantage of laser lipolysis is fast patient recovery. In our experience with more than 2,000 cases, most patients are able to return to normal daily activities within 1.5 days. Laser lipolysis may diminish postoperative pain, ecchymoses, and edema.23,25 Coagulation of blood and lymphatic vessels may explain these advantages. Additionally, due to the liquefaction of adipose tissue as well as small cannula size (~1mm), less trauma is needed to remove fat upon subsequent suction aspiration (Figure 2). In smaller areas, such as submental, inner thighs, and knees, many clinicians opt not to aspirate, further limiting direct tissue trauma. Consequently, patients experience a rapid return to daily activities. The safety of laser lipolysis has been well documented. In 2008, Katz et al26 reported complications associated with laser-assisted lipolysis in 537 cases between January 2006 and November 2007. There were no systemic adverse events. One patient developed a localized infection treated with oral antibiotics and four patients developed burns. The burns likely occurred secondary to a rapid accumulation of thermal energy localized to one area. Finally, out of 537 patients, only 19 required revisions, a touch-up rate of 3.5 percent, which was significantly lower than the 12 to 13 percent reported in previous liposuction literature. Finally, the well-established and reviewed skin-tightening effect is perhaps the most significant advantage of laser lipolysis.20,21 Early reports regarding the lack of efficacy of skin tightening may be related to the steep learning curve of the procedure, inadequate energy application, or insufficient heat accumulation. The authors emphasize the goal internal temperature should range between 48 and 50°C and external temperature of treatment location approximately 38 to 40°C. Surgeons and patients should also remember that skin tightening continues to improve several months after laser irradiation due to the delayed nature of neocollagenesis. While laser lipolysis brings many exciting advantages, some disadvantages still exist. For large areas, laser lipolysis alone may be inadequate for proper correction, and many surgeons still insist that laser lipolysis is an adjunctive treatment to liposuction rather than a liposuction replacement. The flexibility and thin caliber of the laser fiber cannula may inhibit the surgeon's ability to perceive the exact depth in the tissues. Also, due to the relatively narrow window between heat accumulation that denatures and stimulates collagen and dermal-epidermal burns, thermal injury is an inherent risk. Since many surgeons perform suction aspiration in addition to laser lipolysis, the procedural time is increased. One caveat to this is that because the adipose tissue is liquefied, fatty tissue removal should be hastened creating less strain for the surgeon. Finally, the cost of equipment, which can reach well over $100,000, certainly is an impediment to many physicians considering adding laser lipolysis to their menu of services. The primary indication for laser lipolysis is body contouring through the liquefaction of localized deposits as well as skin tightening via neocollagenesis. Laser lipolysis is indicated for any location that demonstrates unwanted fatty tissue and modest skin laxity. These include the submental area, upper arms, abdomen, back hips, inner thighs, outer thighs, knees, calves, and ankles. Patients with irregularities or uneven areas after a previous liposuction or other surgical procedures, such as abdominoplasties, are excellent candidates. Beyond the standard liposuction candidate/patient, laser lipolysis may play a unique role in certain locations, conditions, or scenarios. For example, fibrous areas, such as the male breast, hips, and back, may be particularly suited for laser lipolysis. The smaller cannula size used for lipolysis may facilitate fat melting in fibrous locations without the additional trauma experienced with larger sized cannulas. The ideal candidate for laser lipolysis is a patient who is thin, in good health, and presents with isolated pockets of removable fat. Careful assessment and patient education is crucial prior to proceeding with the procedure. Candidates with too much fat are more likely to not see dramatic results. All patients should be advised that laser lipolysis is not a substitute for healthy diet and exercise. During the patient interview, a full history should be obtained and the patient's goals should be clearly identified. For instance, a patient may have a specific reason for undergoing laser lipolysis. He or she may say, “I have had this area since puberty and it has always bothered me.” “I diet and I exercise regularly; however, I cannot seem to lose this last area.” “I am getting married next weekend.” The patients who make the first two comments will have a realistic expectation regarding their results while the third patient will require education about how quickly results are expected to occur. By evaluating the patient's motivation, the surgeon may better comprehend the likelihood of satisfaction that will result from the procedure. Again, patients should be in good overall health. Some practices require medical clearance over age 60 or for patients with cardiovascular disorders, hypertension, or diabetes. Additionally, patients with liver disease, previous chemotherapy, and antiretroviral medications are at risk due to impaired lidocaine metabolism and lidocaine toxicity. Medication allergies should also be assessed. Patients should be provided with a list of medications to be avoided prior to the procedure that may alter lidocaine metabolism. Contraindicated medications include blood-thinning agents, such as warfarin, clopidogrel bisulfate, aspirin, and nonsteroidal anti-inflammatory drugs. Also, medications that inhibit the cytochrome P450 liver enzymes, such as selective serotonin reuptake inhibitors or azole antifungal agents, can decrease lidocaine metabolism. Laboratory evaluation should include hepatitis panel, complete blood count with differential, partial thromboplastin time, prothrombin time, platelets, human immunodeficiency virus, pregnancy test, and serum chemistries. During physical examination, the patient should be standing in a well-lit room wearing only a disposable paper bikini. In addition to the treatment area, the surrounding liposuction cosmetic units should also be assessed. For optimum body contouring, a patient may benefit from treatment of both abdomen and hips, even though his or her initial concern may have only been regarding his or her abdomen. Any irregularities, dimples, or scars should be identified prior to the procedure so they are not mistaken for postoperative defects. Preoperative photographs are also important to document these findings (Figure 3). Evaluating the quality of the skin tone is also essential. While laser lipolysis can improve skin tone, particularly where skin laxity is exaggerated, it may not be able to create a completely smoothened appearance. In order to assess skin tone and elasticity, the surgeon may perform the “snap test” where the skin is gently pinched between the thumb and the index finger and then released. Instant recoil indicates good skin elasticity, whereas slow recoil indicates poor elasticity. Other indications of poor skin quality include cellulite, dimples, fine wrinkling, and actinic damage. 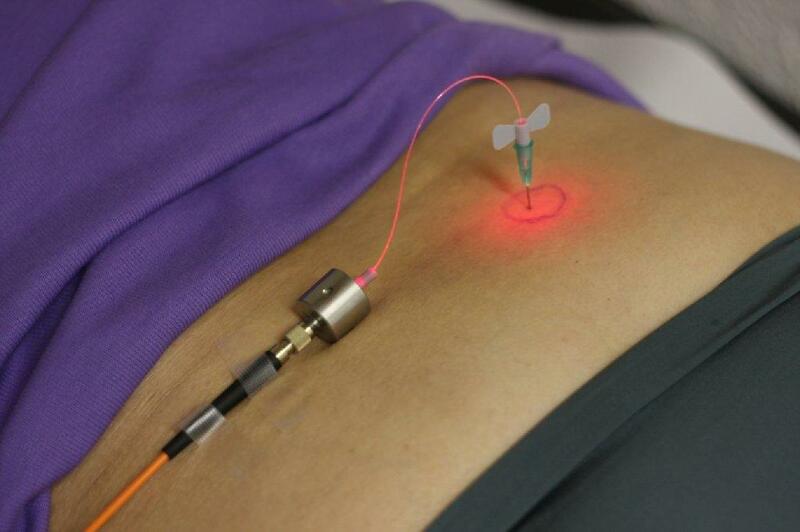 Several measures have been reported to enhance the safety of laser lipolysis and specifically reduce thermal injury. A combination of palpation and skin temperature are endpoints commonly used during laser lipolysis. During lasing, the tissue is continually palpated until it becomes less dense, softer, and more pliable than immediately after tumescent anesthesia was placed. Many clinicians also pinch the skin up to ensure that laser energy is applied to the deep subcutaneous fat and then release the pinched skin and treat more superficially at the deep dermis to facilitate neocollagenesis. Pinching the skin is also used to evaluate the treatment area after lasing to ensure a smooth and even removal of fatty tissue. An infrared thermometer (some devices come equipped with an internal subcutaneous thermometer) should be used to monitor temperature during laser administration, being careful not to exceed 38 to 40°C (Figure 4). Surface temperatures exceeding 47°C may result in epidermal and dermal injury.29 Some surgeons will also place cold compresses or ice packs directly on treatment location after laser irradiation to bring down the external temperature in an attempt to further minimize risk of thermal injury. Finally, additional endpoints such as the accumulated energy may be employed. At the time of this writing, few studies have attempted to quantify energy levels by treatment area. It is difficult at this juncture to make generalizations due to the wide range of energy levels reported in the literature. This may reflect user variability and the dearth of data/knowledge in early studies. It is likely that patients treated early in the development of laser lipolysis protocols were undertreated with insufficient total cumulative energies. In 2009, Reynaud et al30 summarized their experience with 534 procedures and calculated the mean cumulative energies depending on treatment location. They were as follows: 8,100J for the knee, 14,600J for the hip, 10,400J for the inner thigh, 11,700Jforthe chin, 12,800J for the arm, 13,100J for the buttock line, 14,600J for the hip, 21,900J for the back, and 24,600J for the abdomen. Reynaud's study provides a springboard with which to help guide laser lipolysis procedures; however, as with any laser procedure, clinical judgment is paramount. Wide ranges of energies were identified when the mean energy levels were calculated. For example, while treating the abdomen, accumulated energies ranged between 6,000 and 51,000J. Of course these values depend on the size of the treatment location, the depth of cannula placement, number of passes, and individual operator techniques. A handheld infrared temperature gauge (attempting not to exceed 41°C), cold compresses, palpation, and integrated internal sensing devices (available with some newer devices) should all be used as endpoints. While there are potential complications of laser lipolysis, in the author's experience with more than 2,000 cases, the actual complications have been rare. The author has discussed methods of avoiding thermal injury while optimizing energy accumulations. An additional safety concern is the theoretical possibility of nerve damage. In the more than 2,000 cases performed at the author's center, there have been no cases of persistent neuropathy, paresthesias, or numbness. Earlier studies by Goldman et al31 demonstrated histologically intact nerve fibers with surrounding disintegrated adipose tissue, suggesting a selective thermolytic effect. Another issue of concern is the possibility of increased serum lipids as a result of lipolyzed adipose tissue. Goldman et al30 found no significant change in triglycerides and lipid profiles among patients treated with laser lipolysis one day, one week, and one month post-procedure. Goldman notes that several technologies have been aggressively marketed and published in the medical literature as possible noninvasive laser alternatives for adipocyte destruction. The advantage of such technology would be the nonsurgical delivery of therapy. However, the relative paucity of available studies as well as the lack of reproducibility casts doubts on the true effects and efficacy of these light sources. In 2002, Neira36 irradiated surgical sites with a 635nm, 10mW diode laser. Results demonstrated that six minutes after laser exposure, 99 percent of the fat was released from the adipocyte. Transmission electron microscopic images showed a transitory pore and complete deflation of the adipocytes. The surrounding nonadipocytes remained intact demonstrating that the photoacoustic reaction was specific for adipocytes. Neira then studied the effects of LLLT via MRI evaluation of irradiated tissue to assess the depth of penetration within the subcutaneous layer.37 Results demonstrated less defined superficial adipose layer, less defined septae, and more coalescent adipose tissue. Jackson et al38 then applied LLLT externally prior to liposuction procedure. The objective of Jackson's study was to determine whether LLLT impacted the procedure or patient recovery experience. The study noted that for LLLT-treated patients, a greater volume of fat was extracted. In addition, patients experienced a reduction in postoperative edema and pain. Finally, when blinded physicians were asked to rate their ease of extraction, the emulsified fat induced by the laser treatment was easier removed. While an increasing number of studies evaluated the effects of LLLT through the early 2000s, controversy remains regarding the efficacy of this treatment at a clinical level. A recent 2011 study by Zelickson et al39evaluated five patients who underwent LLLT (Zerona System, Santa Barbra Medical Innovations, Dallas, Texas) independent of liposuction. Study participants received six treatments over a two-week period and patients were evaluated by three blinded dermatologists one week and one month after treatment. Circumference measurements failed to reveal statistically significant reduction. Ultrasound evaluation did not demonstrate significant reduction in fat layer thickness. The three blinded dermatologists who evaluated the patients identified treatment photographs correctly 51.1 percent of the time. Three of the five patients recorded a “dissatisfied” rating on satisfaction questionnaires and all subjects reported the effects of treatment were less than expected. The authors concluded that more studies were required to show clinical circumferential reduction before LLLT can be recommended as an effective therapeutic option. Cryolipolysis is an additional modality that has been shown to selectively damage subcutaneous fat without causing damage to the overlying skin. The method is felt to occur via cold-induced apoptosis of adipocytes.38 Still in its infancy, this procedure shows promise. However, additional studies are underway to clarify treatment parameters and safety profile. These two systems are not yet on par with the current safety and efficacy data of laser lipolysis. A new 1444nm device was recently FDA approved for the surgical incision, excision, vaporization, ablation, and coagulation of soft tissue. This latest device comes after the publication of a 2009 Korean study suggesting superior lipolytic effect of this wavelength over other devices by quantifying oil production and histological evaluation.40 Further studies are necessary to substantiate these conclusions. Surgeons are now combining procedures, such as fractional laser or radiofrequency devices, with laser lipolysis to create a synergistic effect of skin tightening. An additional laser lipolysis device (Cynosure's Triplex Workstation, Cynosure) has been introduced to the market. It utilizes three wavelengths: 1064, 1320, and 1440nm. The objective behind adding three wavelengths in one system is to enhance the efficacy and rate of lipolysis and improve skin tightening, reducing operative time. Safety measures that include a subcutaneous temperature monitoring system and motion sensing devices have also been implemented to minimize overtreatment and thermal complications. Clinicians are also excited about the possibility of laser lipolysis for cellulite reduction. Many surgeons have noted an improvement of cellulite after laser lipolysis procedures. They believe that the causes of cellulite are multifactorial, including conformational changes in fibrous septae within the hypodermis that lead to herniation of subcutaneous fat into the dermis.41 Goldman42 recently published an article combining 1064nm pulsed Nd:YAG laser and autologous fat transfer demonstrating improvement of this elusive condition. Additional laser and light devices will continue to advance in an effort to optimize patient safety and clinical efficacy. Current devices are already being investigated for additional purposes such as cellulite treatment, hyperhidrosis, facial sculpting, and periorbital adipose tissue and skin tightening. Future considerations will include more precise laser and light devices, improved technology, and a reduced side effect profile. For laser lipolysis specifically, treatments will be designed to optimize energy output while minimizing side effects, hastening recovery, and improving operator time.